Nestled in rural Mississippi, Camp Levi, a dilapidated old place with no electricity or running water, exists to cure young boys of their budding homosexuality. The smell from four weeks of not showering, the oozing sores from the bodies of the campers, the polluted lake used for total immersion, the Sweat-Shack, and the death of a fellow camper just days before liberation haunt still Will a decade after leaving the camp. Although Will never forgets Camp Levi, the light shines brighter on those buried memories with the release of a new movie based on those barbaric four weeks. With past and present intertwined, Will must return to the abandoned campgrounds to solve the mystery of the summer that changed his life forever. How to Survive a Summer is a modern Southern-Gothic horror story that you will never forget. A searing debut novel centering around a gay-to-straight conversion camp in Mississippi and a man's reckoning with the trauma he faced there as a teen. Nick White is an Assistant Professor of English at Ohio State University. A native of Mississippi, he earned a Ph.D. in English from the University of Nebraska-Lincoln. His short stories have been published in a variety of places, including The Kenyon Review, Guernica, Indiana Review, Day One, The Hopkins Review, and elsewhere. "I love the slow-moving, Southern Gothic style of storytelling, and the way Nick White painted all his characters—even the antagonists—with unexpected strokes of empathy. Themes of redemption and forgiveness shine through, the most beautiful being Will’s self-forgiveness." 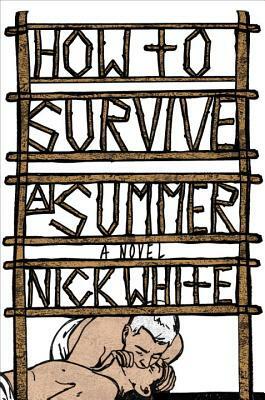 "With How to Survive a Summer, Nick White has written a mesmerizing debut, weaving together long-cherished elements of Southern fiction with an unmistakably modern sensibility."